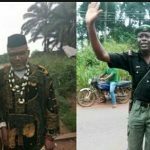 Tension In Umuahia As Security Vans Flood Nnamdi Kanu's Hometown. Tension In Umuahia As Security Vans Flood Nnamdi Kanu’s Hometown. 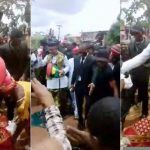 The Indigenous People of Biafra (IPOB) on Saturday, June 3, said the Department of State Services and the Nigeria police Force was out to cause trouble in Umuahia, Abiastate’s capital city. 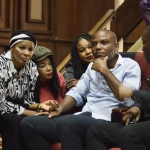 The is backed by silent reports that Nnamdi Kanu might be returned to Kuje Prison for operating out of bail conditions. IPOB had alleged that the security institutions are focused on intimidating its members and leader Nnamdi Kanu. In a statement, the group said Isiama Afara Ukwu, the hometown of its leaders was currently flooded with vans belonging to the Nigeria police and the DSS.The IPOB said the numerous vans were patrolling the streets of Afara Ukwu and were also seen at strategic positions close to the resident of IPOB leader. The IPOB said security institutions are focused on intimidating its members and leader Nnamdi Kanu. 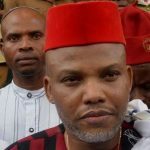 Also, sources within the Kanu’s family said that the vans were used to convey the security operatives in plain clothes around the hometown of the IPOB leader. 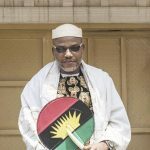 IPOB Sacks Nnamdi Kanu’s Defence Lawyers!